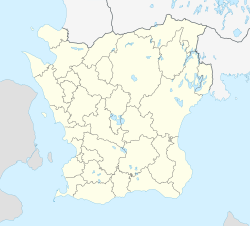 Ystad (Swedish pronunciation: [ˈyːsta]) is a town and the seat of Ystad Municipality in Skåne County, Sweden. Ystad had 18,350 inhabitants in 2010. The settlement dates back to the 11th century and has become a busy ferryport, local administrative centre and tourist attraction. The detective series Wallander, created by Henning Mankell, is set primarily in Ystad. Street plan of Ystad in c.1850. Ystad connects the Ystad Line and Österlen Line railways. Passenger traffic runs between Malmö and Simrishamn (operated by Skåne Commuter Rail) and the town also has direct rail services to Copenhagen via the Øresund Bridge (operated by Danish State Railways). The most popular sport in Ystad is handball, with two big clubs. Ystads IF is in Elitserien (the highest Swedish men's national league, as of 2008[update]) whilst IFK Ystad is situated in Division 1 (the second highest league, as of 2008[update]). Several famous handball players have played for these clubs, including Per Carlén. One of Sweden's most well-preserved medieval monasteries, the Greyfriars Abbey, lies in Ystad. The town also has an additional large medieval church, the Church of the Virgin Mary (Mariakyrkan). Both are highly influenced by Gothic Hansa architecture (which can also be seen in churches around the Baltic Sea, for instance in Helsingborg, Malmö, and Rostock) and are among the best examples in Sweden of Brick Gothic. In addition, there are areas of surviving medieval town architecture, like the Latin school (built c. 1500) and several town houses. The city is also included in the European Route of Brick Gothic. From the steeple of the Church of the Virgin Mary the Tower Watchman (tornväktaren or lurblåsaren) sounds his horn every 15 minutes from 21:15 to 01:00 to let the people of Ystad know that the town is safe from fire and enemies. The Tower Watchman also says a special line when sounding his horn: "The clock strikes .... (for example twelve). All is quiet! From fire and thieves may God preserve the town!" The tradition has existed since the eighteenth century. 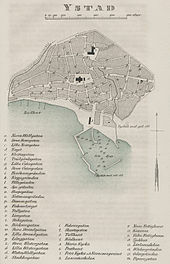 Wikimedia Commons has media related to Ystad. 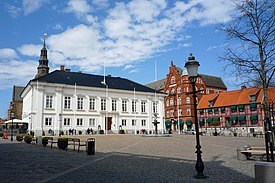 Wikivoyage has a travel guide for Ystad. "Ystad" . Encyclopædia Britannica (11th ed.). 1911. ^ "On the Kurt Wallander trail in Ystad, Sweden | The Independent". web.archive.org. 2017-05-01. Retrieved 2018-12-12. ^ "Ystad's history in a nutshell". Ystads kommun. 2011. Archived from the original on 27 September 2011. Retrieved 5 August 2011. ^ a b "Ystads befolkningsutveckling 1570-1995 (Swedish)". cybercity. 2011. Archived from the original on 16 July 2011. Retrieved 6 August 2011. ^ "Wallander's Ystad | Visit Sweden". visitsweden.com. Retrieved 2018-12-12. ^ "Wallander - Ystads kommun". www.ystad.se. Retrieved 2018-12-12. ^ "Øresund trains to Ystad (Danish)". DSB. 24 May 2004. Retrieved 7 August 2011.